I want to speak about some events which followed the publication of The Man Who Mistook His Wife for a Hat. There had been a... a review by a... well known neurologist... well, actually a very good neurologist, a chap called John Marshall who was at Oxford and whose work I admired, and I was very glad that he wrote a review in the... in The New York Times, and it was predominantly a positive review, but with one qualification. 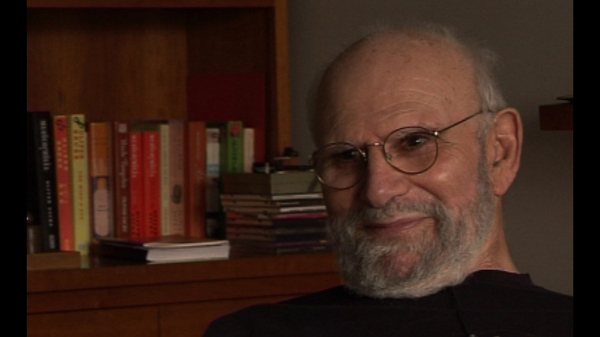 He said, 'Dr Sacks is disingenuous. He pretends to know nothing about a subject and only to get interested in a subject when a patient appears, and then to, sort of, find out more, whereas we know this is not the way neurologists work. Neurologists bone up on a subject first and then see the patient, full of... knowing all the published work on the subject'. I wrote to thank him for his review but protested at this point, and he said, that's okay, you know, we... we know how things are. But then early in '87, I got a letter from a patient, a man, an artist, who said that some months beforehand he had had a car accident. He had been amnesic for a day and had some other problems. He couldn't read for a day or two. He said the police report of the accident, he said, appeared to be written in Greek or Hebrew and was unintelligible, but the most important and distressing thing was that he had lost all perception of colour with the accident, and this hadn't returned in the least. He asked me whether I had ever encountered such a condition and whether I could be of any help. I wrote back to him, saying, no, I had never encountered this and I didn't know if I could help, but he should come and see me. When he came, he brought in a thick folder of papers on acquired achromatopsia to give it the... the proper title of colour blindness of cerebral origin following a stroke, an accident, or whatever. Basically, he brought me the world's literature on the subject, and he said... I said, 'Where did you get this?' And he said that he had written to my reviewer, to John Marshall, and John Marshall's response had been to send him all the literature. My response was to come and... was to say, 'Come and see me'. And I... later I told that story... that story to John Marshall, but I don't think I changed his mind. Now, this was a very... a wonderful and interesting man. A gifted artist and articulate, he described how devastating things had been at first when he found himself, as he put it, in a... in a leaden world. How he... he couldn't imagine returning to painting, he was an abstract expressionist who was quite famous for his use of colour, and he didn't know how he could continue as a human being. He was appalled by his wife's appearance, by his own appearance, he couldn't imagine colour. He couldn't retrieve it from memory. This interested me very much because I... it had never occurred to me that colour might be constructed in the brain, perhaps by many different parts of the brain working in concert, and that this construction was as necessary for memory and imagery as for perception. He even told me that when he got migraines, and in a migraine one can have a zigzag which typically has brilliant colours associated with it, he said his migraine fortifications were black and white. I... now let me get the order right. So I was very, very interested by this patient, and when I went to La Jolla, I was asked to give a talk at the Salk Institute, followed by a dinner. Francis Crick came up, seized me by the shoulders, sat me down next to him and said, ‘Tell me stories’. In particular he wanted stories of visual mishaps, of alterations of visual perception or imagery. So I told him a number of stories, including the story of the colour-blind painter. And this was the start of a correspondence with Crick. I'd never... I'd had a, sort of scientific... a more clinical correspondence with Luria, but this was now a much more scientific correspondence with Crick, and I was started to be drawn into neuroscience. I think the Hat book was... was almost exclusively descriptive, whereas now I had to think, what is going on in the brain, and where, with this loss of colour, and can anything be done about it?